A place for the manager, who works here with the added expertise of the Food Plus Operating Manual. Here orders are created and deliveries accepted. With a practical warehousing and sales system, you readily know what sells best, which products rotate poorly, and on which you are losing money. A CCTV system helps maintain control over the sales room. At the same time, the space serves as a storage room, which must be appropriately managed too. Cold cuts is the store area that generates the highest profits. Food Plus helps in #an effective management of that assortment and its proper display. What matters is the knowledge of what to sell and how to serve the customers so that they are happy to visit us again. We have framework contracts for the supply and service of scales and slicers. It is one of the most important places within the sales floor, where a changing display of promotional products generates the highest turnover. Baking deep-frozen bread products is a standard in modern retail. The smell of fresh bread is part of scent marketing, which aims to attract customers to the store. As part of a framework contract with an external provider, we offer you access to that type of equipment. These include price tags and promotional labels. The Food Plus network provides them to franchisees so that their shelves are well marked and promotional products more visibly displayed. It is impossible to imagine grocery trading without ready-made food. Owing to a framework contract with an external provider, we provide our franchisees with broad access to that type of products, as well as freezers. 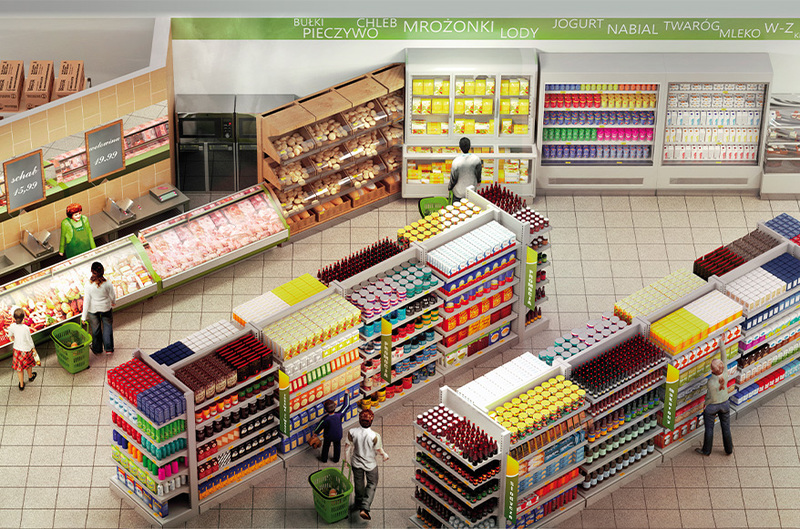 A wide range of dairy products that make a flagship section of each Polish store. A variety of products will definitely spice up a cart of native shoppers. Food Plus experts will professionally plan the layout of your store, taking into account the characteristics of each assortment category. Here the customers will find typically Polish portioned cakes, which are also sold by weight. It is placed in a location that cannot be overlooked and used to display consumer promotions, available only to participants in the Food Plus network. Apart from the standard task, i.e. the sale of alcohol it offers services like remittance and dispatch. Launch of the "Polish" hot dogs, sandwiches and hot drinks is typical of convenience stores. Running this type of service, attracts customers allowing you to increase turnover. 13 Launch of the "Polish" hot dogs, sandwiches and hot drinks is typical of convenience stores. Running this type of service, attracts customers allowing you to increase turnover. This is also the place where customers come into contact with loyalty programmes. Centrally organised, attractive competitions and promotions are supported by advertising and encourage consumers to shop in the Food Plus stores. Cashiers, like other employees, are the frontline pride of the store. Therefore, Food Plus offers on-the-job training and personnel uniforms. If we want to see a higher amount on the receipt, we must provide the customers with a wide choice in this product category. Thanks to Food Plus, you will learn how to properly take care of and display these product categories. Poles expect access to Polish newspapers, magazines and books. Thanks to our framework contract with an external provider, you will find the most widely-read titles on your shelves. Food Plus is the best solution in the changing market conditions. Membership in the franchise means the strength of purchase terms as well as support and safety in conducting business. set of such effective marketing tools as: leaflets, consumer competitions, advertising campaigns in the media or events for the opening of new shops, POS materials, including: advertising posters, price strips, carrier bags or shelf-stoppers,support from experienced Customer Advisors. Presentation of the Food Plus concept by a Mastermedia Sales Representative. After the presentation, you are free to refer to us any additional questions. Be one step ahead of the competition – join Food Plus today! If you are a person who has premises (ownership or rental) and leads there the shop and on the basis of franchise Food Plus wants to increase turnover. If you are a person who does not have a place, but wants to open a Food Plus store and build success.